You got to grow it from the seed..."
Question: How Many Pairs of Earrings Have You Made? I think a few of you have some catching up to do. Hmmm. That, or, a few of you, er, us need to lighten up! Thanks guys! What a nice design. Goldstone and the Italian Monks? Did you know that goldstone is made by Italian monks? Hmmmm. I didn't think they had time -- I thought they were too busy making rosaries out of olive pits! So I did a little Googlesleuthing. Wow! There is certainly plenty of goldstone lore out there. The first monk-related tale I located said that the little copper bits accidentally fell into the vat of molten glass. So what, a sloppy pig of a monk just happened to have a bowl of mushed up copper salts right next to the pot (leftovers maybe? ), and his sloppy young assistant tripped and spilled it? Doubt it. As if they didn't do purposeful experiments back in the day. And I Googled some more. Wikipedia says that goldstone was discovered by the Miotti family in 17th century Venice. 1626 to be precise. Aha! Other tales say that it was discovered by monks seeking to make gold -- the alchemist monks. Now, there's a reasonable possibility. Apparently there were indeed monks (not necessarily from Italy), who sought to make gold. But this was long before 1626. In fact, the Cistercian Order officially banned gold-making experiments back in the 12th century. But alchemy was science in Europe until chemistry pretty much took over, around the same time the Miottis developed goldstone -- and were granted the exclusive license to it under Italian law. Another silly story is that the formula for making goldstone was kept secret for centuries, until the Chinese discovered how to make it. Hmmm, OK. The goldstone we get nowadays is indeed made in China, according to Russ at Rings and Things. Certainly, glassmaking secrets did help the Venetians (the Italian ones, not the ones from Venus -- kidding!) keep a monopoly on the glass trade all the way from the 12th century and beyond... Indeed, there were very harsh punishments for leaking the formulas and methods to foreigners. Members of the glassmaking families of Murano (the island outside the city proper where the glassmakers were moved to...) were not even allowed to leave without permission. But leave they did. By the 17th century, several European cities had their own furnaces and their own expat Venetian masters of the glass. So the idea that China would somehow sneak in is a little far fetched. Besides, China has its own history of glassmaking, and stuff. And one little known fact is that Murano glassmaking techniques originated in 9th century Rome, thanks to Asian and Muslim influences. They'd been doing glass for awhile already. Hey, I'm all for telling a good story -- it does help us hawk our wares. But let's just call goldstone a man-made chemical experiment that succeeded. Heck, the real story is every bit as interesting as the lore, IMHO. Here's a great link on the history of Murano glass, though I haven't found anything (yet) about the Miotti family. I get jealous all the time. I keep it to myself, pretty much. Snarky, resentful, critical, looking down my nose. Gets me nowhere. All the energy I spend being jealous of somebody else's success and recognition weighs me down, and I know it. I feel guilty (a little bit). I justify it (a lot). When I'm tired enough of it, I do something about it. I ask myself "What does that person have that I want?" That's usually what it is. They have more time to make art. They have a tidy studio. Or a roomy studio. Or a better haircut. They are getting more recognition. They're selling more work, for better money. They do better marketing. They have admirers. It doesn't help to analyze WHY I want what they have. I don't have to explain my own wants. To myself. That gets a tad circular, if you know what I mean. And then I get determined. That energy that was sucked up and stagnant becomes free and alive again. Ok, am I willing to do what I would have to do to get what they have (or what I perceive they have -- I mean, I've had a fan or two and some of them are pretty darned unpredictable, so, be careful what you wish for). Am I willing to make less money and make more art? Am I willing to clean my studio? Am I willing to market myself, make better quality stuff? Am I willing to spend the next two or three years moving toward my own vision of smart and cool? Sometimes the answer is no, but at least the focus is back on me, where I have choices and control over how I do my thing. And then I can wish them well. Send them a mental bouquet of congratulatory roses. Visualize them napping in the arms of their muse. 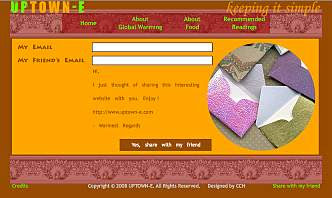 Maybe even contact them, link to them, mention them in a positive way to a friend, invite them to the next gathering. And then, finally, it's time to visualize ME napping in the arms of MY muse. Wake up refreshed, and get back to work on my own thing. Well golly gee willikers! 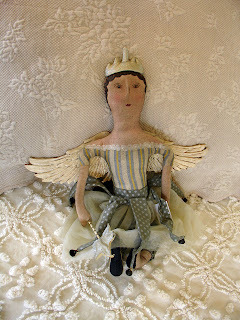 Cyndi Lavin interviewed li'l ole me for her great blog, Beading and Jewelry. And I got to blather on about how and why I like to do what I do the way I do it, and also mention a lot of my teachers and influences. While you're at YouTube (click the title of this post to go straight to the video over there instead of here), check out the related videos for more wire wrapping tutes! P.S. Click the forward arrow once or twice (depending on your browser settings) to play the video above. . .
Who put the fire in the fire polished beads? The photos above come from Beki's Haley's Out on a Whim website. The originals (click the photos) are larger and show the sharp facets on crystals compared to so-called "fire polished" glass beads.I've always wondered where the term "fire polished" came from. 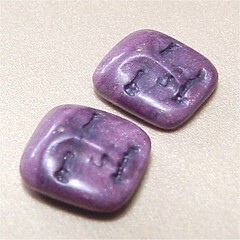 Lots of times, vendors create exotic nomenclature to spice up a less than stellar bead or gemstone. 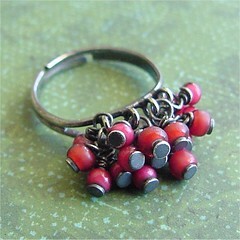 But Czech fire polished beads are first quality -- so, what's with the name? A couple of expert vendor/collectors solved the mystery for me recently. Apparently the FP beads are pressed glass, and come out of the molds with bits of flashing on their edges that need to be tumbled off. The tumbling dulls the glass surface, so they're heated over fire to restore their shine. 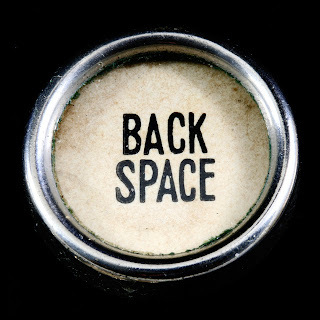 Chris says, "A Czech bead seller acquaintance informed me once upon a time that it takes a couple of years - yes, years - of training to develop the judgment necessary to tell when to pull the trays of firepolished out of the oven." The polishing softens the edges, making FP beads distinguishable from lead glass crystal beads, whose edges are much sharper (again, check out the photos at Beki's site). Contrary to what I've heard over the years, the lead content in the crystals doesn't actually make them more durable -- nor does it make the edges sharper. 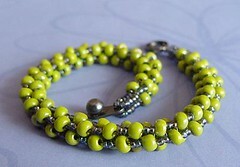 The lead content does, however, make the faceted beads more reflective. Chris shared this link: http://www.lenntech.com/Glass.htm for a quick summary of glass types and what they're good for. Beki Haley is a jewelry designer, metal clay and beadwork instructor, and owner of the bead store Out on a Whim in Cotati, CA (and on the web). Chris Prussing is a bead collector and was a long-time bead shop owner in Juneau, AK. 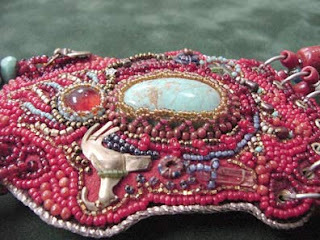 She is the author of Beading with Right Angle Weave and temptress of BeadHell, where this discussion originated. Recently, Chris opened up an Etsy shop to sell her beaded kits and creations. 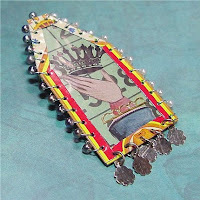 Jenny Fillius of Lady Bug Circus posted about the recycled tin brooch she bought from me. I am so relieved she likes it cause she does amazing tin work herself! 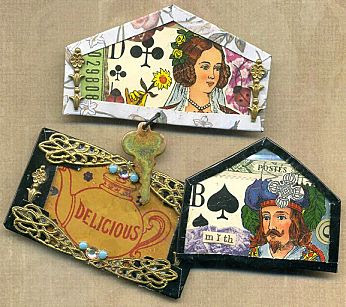 Check out her blog and Etsy shop to see her colorful assemblage work with recycled metals. What's Your Favorite Jewelry Metal? Question: What's Your Favorite Jewelry Metal? Hey, I'll take a clear diagram over lengthy text instructions any day. But give me a clear diagram and CONCISE instructions? I'm in craft heaven! So yesterday I was working on some tutorial illustrations, trying to make them as clear, concise and non-repetitive as possible. After 5 minutes, when my brain got tired, I bailed and went surfing for a surface technique I hadn't tried, and found Bokhara Couching at the site below, a rediscovered gem of a resource for embroidery (and there's lots more there besides the stitches).